Angola, IN, June 20, 2017 –(PR.com)– Hudson Aquatic Systems, along with CET CryoSpas, would like to announce a partnership that will allow Hudson to offer CET CryoSpas ice bath recovery products that support faster recovery, help reduce fatigue, improve performance, and minimize the risk of injuries in athletes within the United States. Hudson will be introducing the new CryoSpas’ Mini at the NATA Symposia (National Athletic Trainer’s Association) and AT Expo in Houston, Texas, June 27-29, along with their own AquaFit underwater treadmill system and its updated features. The new Cryospa is specifically designed for icing elbows to speed recovery for pitchers, tennis players and other athletes’ arms that can be overstressed. CryoSpas ice baths are an affordable option for recovery without the expense of purchasing ice and does not require constant cleaning. 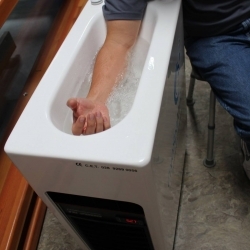 They offer units with cold or warm water full body immersion to the immersion of just one limb, such as an arm or an elbow. CryoSpas relies on four main factors to achieve the greatest therapeutic effect; turbulence, temperature, pressure, and salinity. “The strategy for the CryoSpa Mini was developed to specifically target the problem of pitcher’s elbow when the Blue Jays were challenged with a potential career ending injury for some of baseball’s most valuable players,” said Edgar. “We’re constantly striving to improve our products and the new CryoSpa Mini is a good example of that.” More info on CryoSpa products is available at http://www.cetcryospas.com. Hudson Aquatic Systems is located in Angola, Ind., and has been manufacturing aquatic therapy equipment and systems dating back to the 1920’s. Hudson designs, engineers and manufactures the highest quality performance aquatic systems, therapy pools, swim spas, and hydrotherapy products for the human, canine and equine markets, and can be found around the world in fitness centers, hospitals, veterinary teaching colleges, YMCAs, physical therapy offices, college and professional sports training centers, military facilities and hospitals, and equine barns and tracks. For more information: www.hudsonaquatic.com. Hudson will also be offering CET Equine Spas to treat equine athletes with leg issues by removing painful inflammation, including: joint problems, ligament injuries, shin splints, abscesses, tendonitis, etc.